Outdoor Website Design is not just a fishing guide website design company; we are the most successful marketing company in the fishing industry that uses the Internet to drive visitors to fishing guide websites! In Fact our company has over 15 years of success on the internet marketing fishing websites for the outdoor industry. We use this experience to help fishing guides succeed on the internet with proven successful website development, custom websites, strategic plans and social marketing to help your outdoor related website not only meet the goals of the industry, but exceed them but producing the results. Let Outdoor Website Designs take your fishing guide website to the next level with proven techniques and by using our advanced marketing strategies specifically designed for the fishing guide industry. Our website solutions provide you with the most advanced search engine optimization along with strong website development tools and custom website design. Take a tour of our website portfolio and see for yourself why Outdoor Website Designs is the best solution for a fishing guide service or any related outdoor business. When it comes to fishing guide website designs, we know that first impressions are a big part of the game, but it’s not everything. We also understand that each customer, each industry, each region, each species of fish has a different need, preference and expectation. Outdoor Website Designs works hand in hand with your fishing guide business to understand and develop a website to attract more of your visitors and which in return generates more customers for you. Outdoor Website Designs is the answer to your website questions. 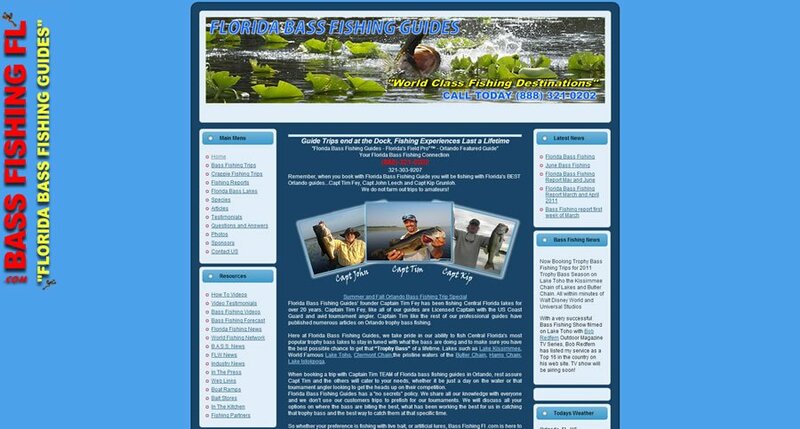 Check our Client Portfolio to see some of our fishing guide website designs. Contact any of our customers, feel free to ask them what our website designs have done for their business. Outdoor Website Designs is a specialist in fishing guide website designs & search engine optimization. We understand the industry and no one can come close to our experience or success record. Everyone know the difference between the first page and the fifth page in Google is huge when it comes to organic search results, many companies sell the promises but we can prove it with proven results. Facts are, almost no one ever searches past page two on search results. If you are not in the top two pages, then your competition. It takes knowledge and a lot of hands on work to win the search optimization competion for the outdoor industry. We always go the extra mile to make sure you get the results you expect and we promise. Outdoor Website Designs will help your fishing guide website with all of your internet marketing needs. Contact us today for a free quote!